The problem with Alex Nicholas is that he won’t stay dead. Alex Nicholas was the consummate Queens bookie: fast cars and even faster women, and friends in all the wrong places. As an illegal sports betting and loan shark king in New York City, Alex was fearless—until the night his luck ran out and someone leveled the silver barrel of an automatic on him and pulled the trigger. Michael Nicholas was everything his brother Alex was not: a powerful, married straight-arrow corporate CEO living the American Dream. Their two worlds collide when Michael discovers his brother’s secret laptop. E.J. Simon was the CEO of GMAC Global Relocation Services (a division of GM) and the managing director of Douglas Elliman, the largest real estate company in New York. He is a consultant to many leading private equity firms and has held senior-level positions at prominent financial services companies. 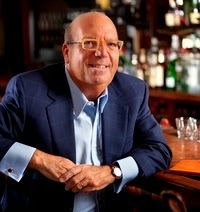 He is a world traveler, food enthusiast and lives in Connecticut. 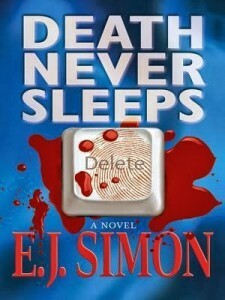 DEATH NEVER SLEEPS is his first novel. Michael Nicholas’s life is turned upside down when his brother, Alex, is murdered. Not really close as adults, Michael must now take care of his estate and settle his debts. This isn’t as easy as it looks since it looks like his brother was not quite on the up and up and into a mobster named Sharkey who wants almost a million – NOW! This starts off as a murder-mystery but soon turns a bit sci-fi as Alex has equipped his Mac with a program that lets him have a life after death. This is really well done and is entirely believable. The story is fast paced and takes you to some wonderfully described places as well as makes you a bit hungry with the food discussions. The two main characters — even with Alex now residing in a computer play off each other nicely. I think I liked Alex better as intelligent life residing in the computer. Michael is truly a corporate leader and thinker, use his analytic skills to unravel Alex’s murder while Alex leads him on. Overall, a very fun read and I would definitely read another by this author. This looks like a good mystery. Can;t wait to read it. Sounds like a fantastic murder mystery. I would love to read it to see how Michael handles everything. Thanks for having this giveaway. Mysteries are my favorite genre! This sounds like a good one! Thank you for the giveaway!